This will be my third Christmas spent in my tiny home on Military Base Housing. I know some of you reading this blog know my struggle. You may be just like me, living in base or post housing or possibly a apartment dweller, or dorm room student. The rooms are small, tiny and can sometimes feel more like a hospital room or a staged apartment than a home. The last year has been rather stifling to me because we have far outgrown this space. In fact, we have never been very comfortable in this small space, but we have made due. I have my three boys, my husband, myself and my Chihuahua, Kiwi that reside here and some days its like we are walking on top of each other just to go to the bathroom. Hopefully that changes for us soon, but I also have to remember to be humble. Not everyone has a warm bed in a clean and safe home and it is selfish of me to not remember that I am one of the lucky ones. Truthfully this is the first year that I really went all out and dug out the Rubbermaid containers full of collected Holly Jolly and Fa La La and Decked my Halls with the joy of the season. Doing so was actually therapeutic for me. I was in a funk because when you love home décor, crafting and collecting antiques, and you don't own the space you live in, it gets hard to not feel creatively stunted by lack of ownership freedom. I decided I was going to reflect the things that make me happy in by decorating vision and use items I already had to make this season feel as homey and as organic as I could. I wanted to make sure my home didn't feel staged so I kept with the natural and eclectic style I love. I am completely obsessed with the quality and craftsmanship of antique furniture and try my best to avoid any mass produced pieces in my home. I'm not a spring chicken so I have had a few decades to build my collection of antique furniture and I love nothing more than to use those pieces for everyday function and style. 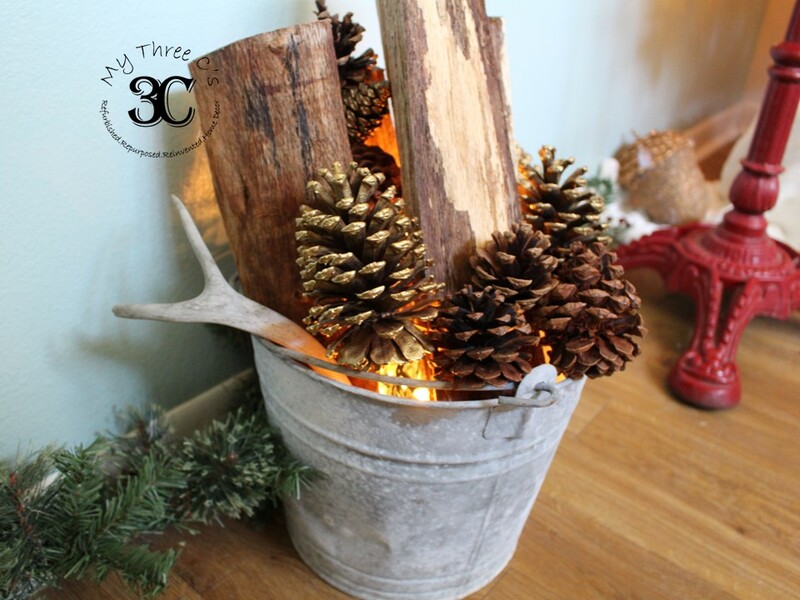 I also love the great outdoors so I am always using natural and weathered elements such as, antlers, animal effigies, pine cones, rustic woods and rusty metals. 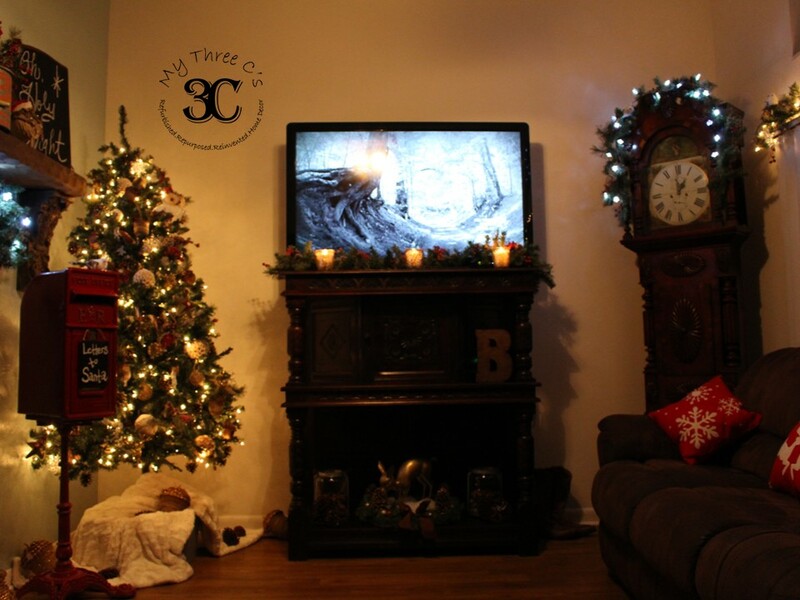 Here is a look at my whole Living Room all decked out and through this post, I will break down where my items came from as well as why I chose them. 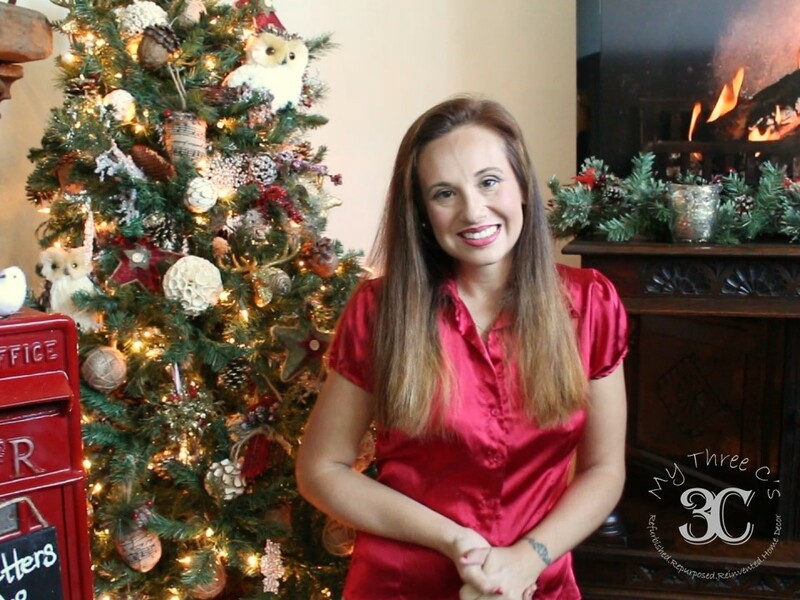 To see the Christmas Living Room Video Tour, Please click on the link. Last year I went to Big Lots and found they carry a new collection called the Woodlands Collection. I fell in love with the animal figures made of twigs, pine cones and various shrubbery. 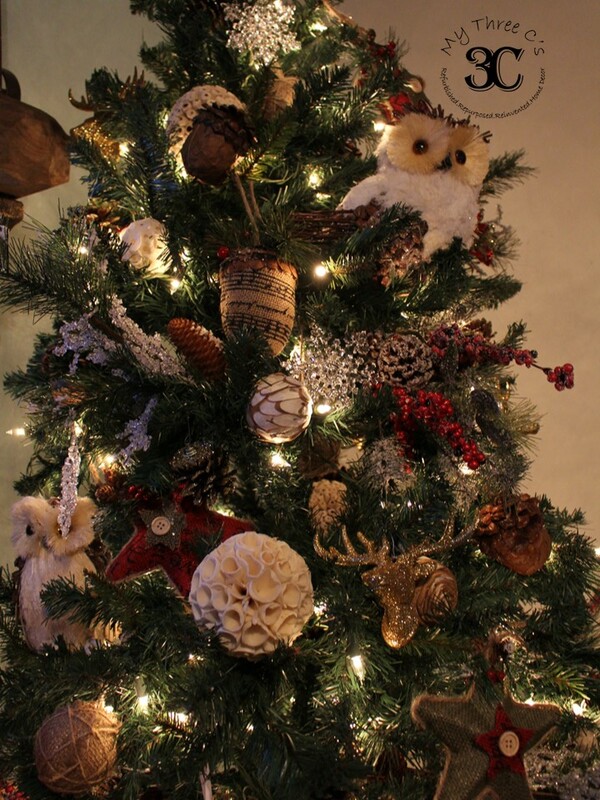 I bought several owls, and deer as well as ornaments that reflected that nature inspired theme. I normally buy a real Christmas Tree but this year I wanted to remain frugal and used a artificial tree I already had. My Christmas Tree contains globes made of corks, and shaved wood, twine and burlap ornaments and glittery deer busts. 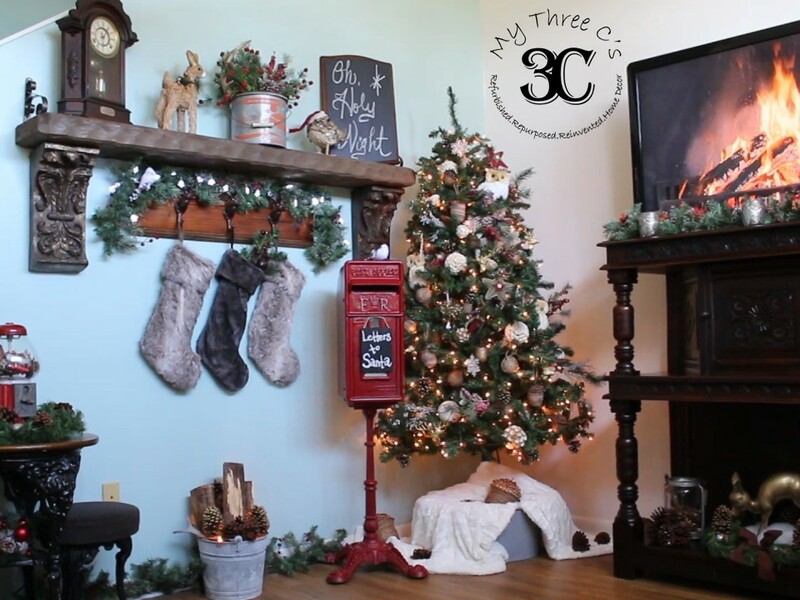 I inserted sprigs of snow covered branches and red winter berries to incorporate some more color to the artificial tree. 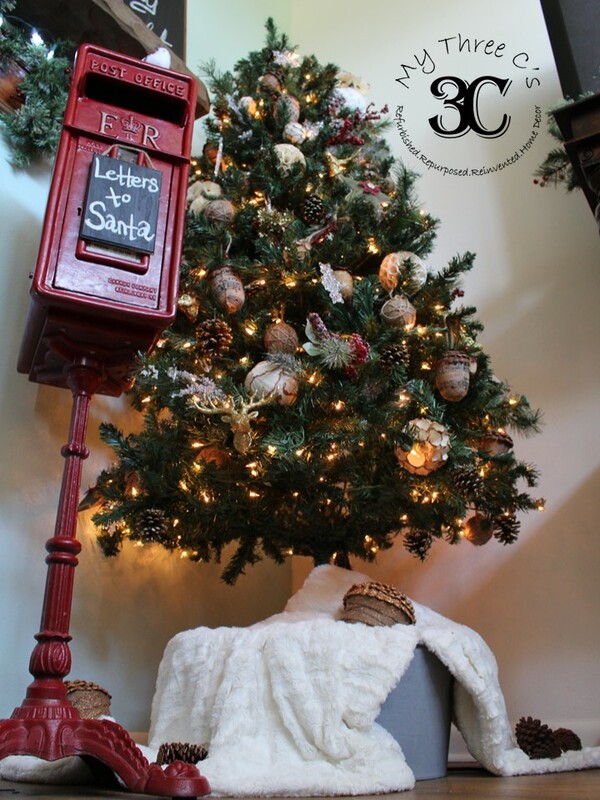 Pine Cone and Acorn Ornaments also add woodsy aspects and give it a more realistic appearance. Since last year I struggled with "just the right" tree skirt. 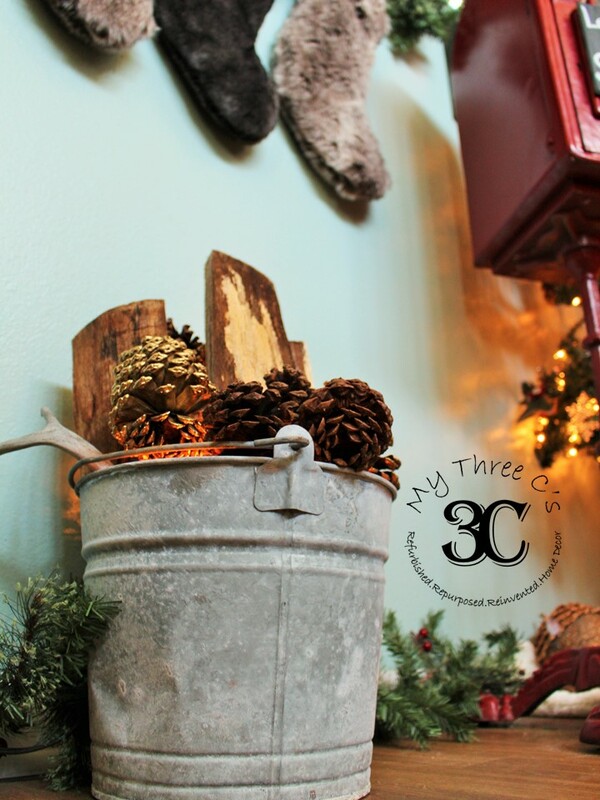 Nothing looked natural enough to me so this year I bought a Faux Fur Throw from Big Lots and used it and a big galvanized flea market bucket to camouflage the artificial tree base. It is soft and creamy and gives the illusion of fluffy snow. I sprinkled some pine cones I collected on the blanket and some glittery acorns to replicate the ground of a wintery forest floor. The mailbox you see is an actual antique British mailbox I brought back with me from my travels. Last year, I used it to magically deliver letters to Santa all the way to the North Pole. My little ones loved it so it is now a family tradition! 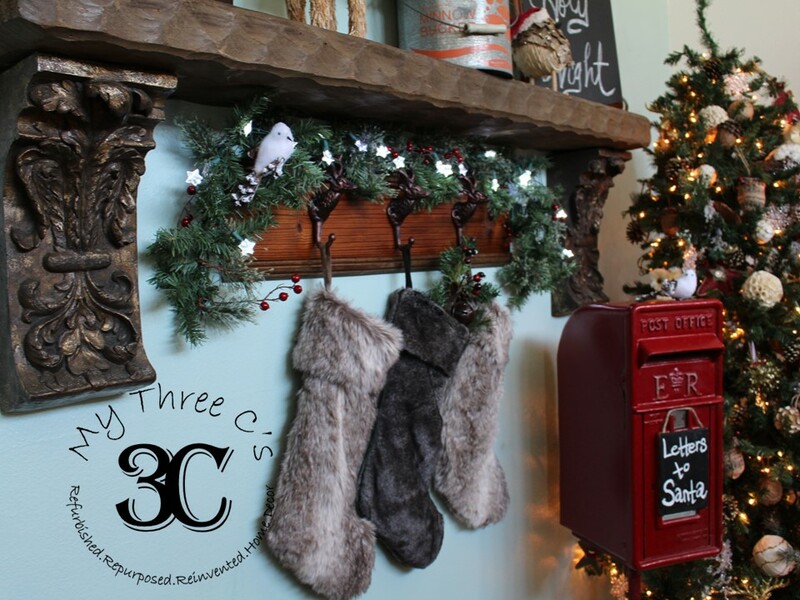 To see how the Christmas Stocking Hanger was made, follow the link to my DIY Video. 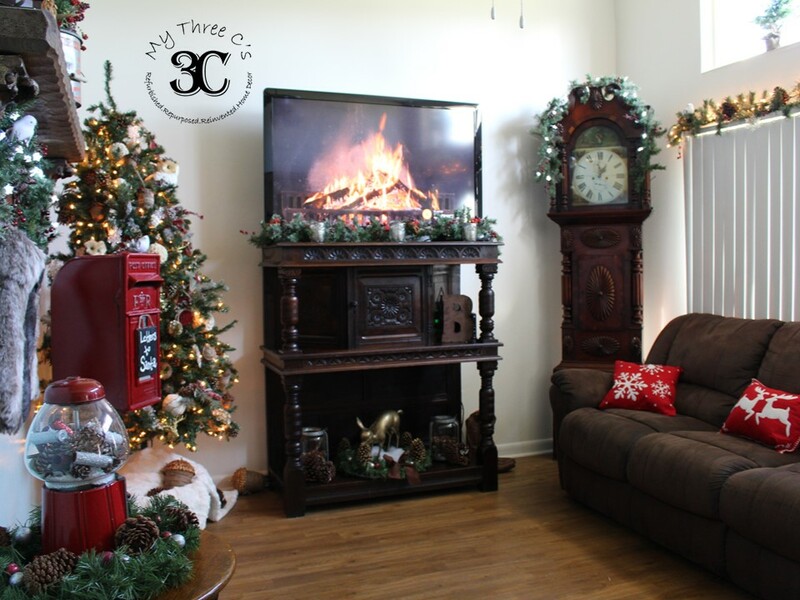 Florida is not known for frigid temperatures that require a fireplace and a roaring fire, but what cozy winter wonderland would be complete without a mantel complete with a faux fire. 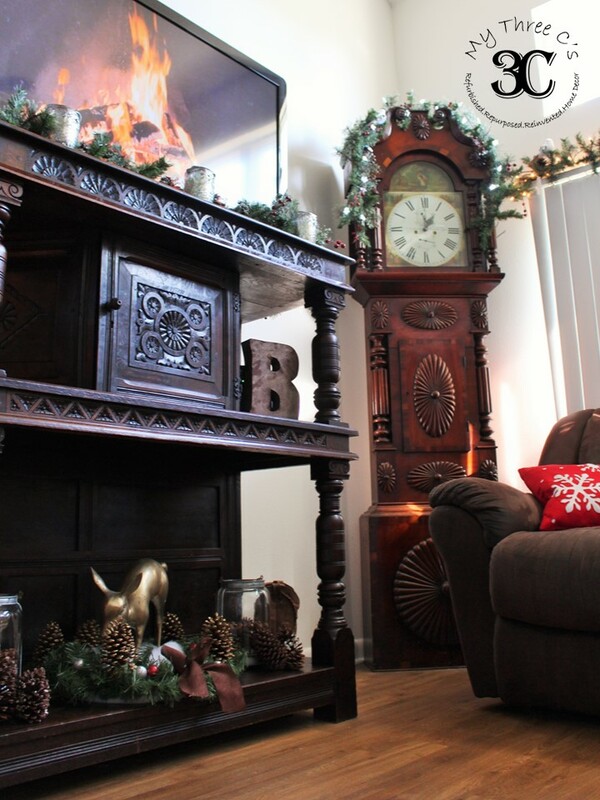 I have had the idea of creating my faux mantel for quite some time but only erected it this fall. I am so thankful that I did! I love the way it ties my Christmas décor together and gives the illusion of a grand hearth despite my limited square footage. 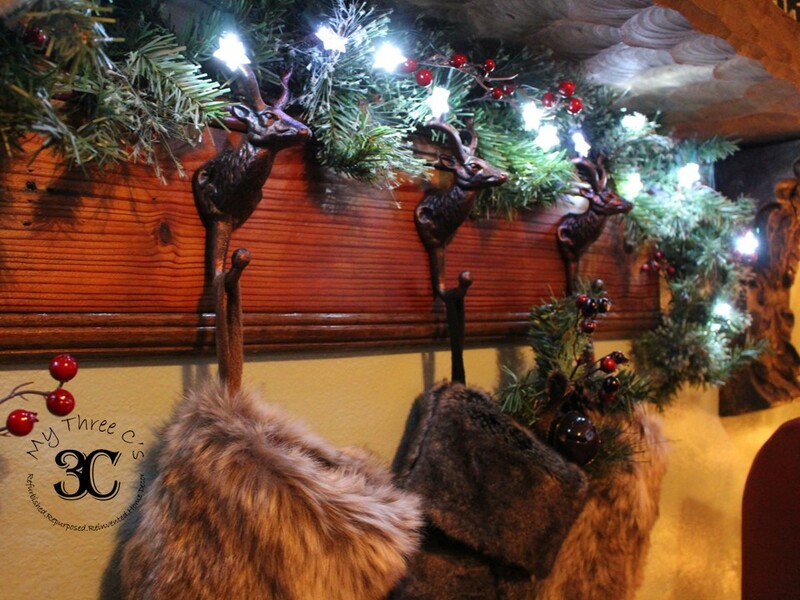 To see how I camouflage the Christmas Light Extension Cord please click the link to see my Video Quick Tip on YouTube. One of the trying architectural elements of my base house is the windows! All base houses in my community come with white vertical blinds which are very hard to decorate around. My home also has three windows that sit above the initial windows for added sunlight. While the sunshine is beautiful, it takes some imagination to find a way to complement the look. Rather than invest time and money on drapes for this area, I decided to work with the design. Why fight it! This is a rental, and not my forever home. 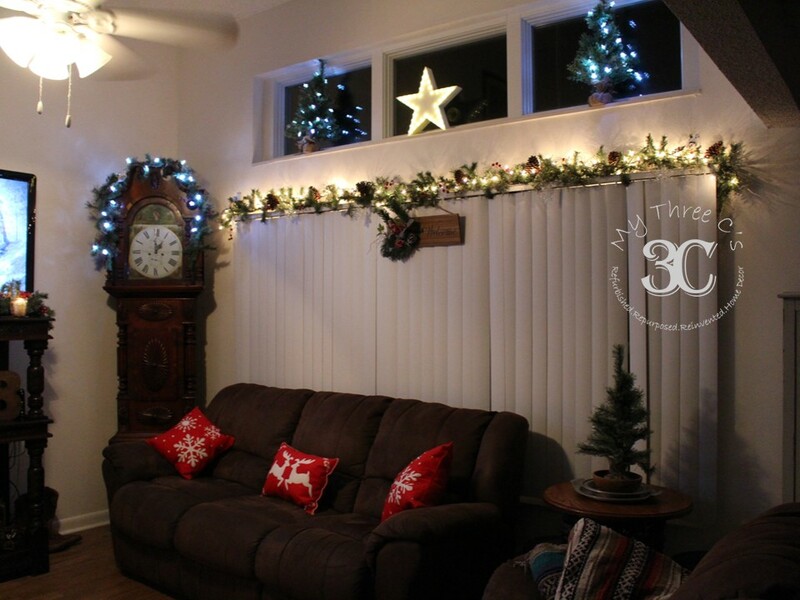 What I did to tie in the blinds and windows was to trim them with garland, pinecones tiny trees and a very Texas in Florida Star Marquee I found at Big Lots. 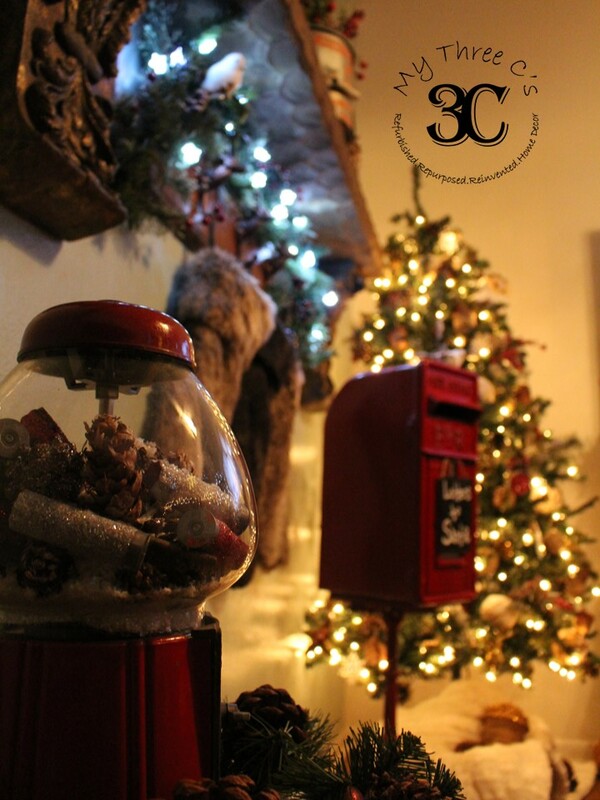 To see how I used this vintage Bubble Gum Machine as a Snow Globe, see my DIY Video by clicking on the link. 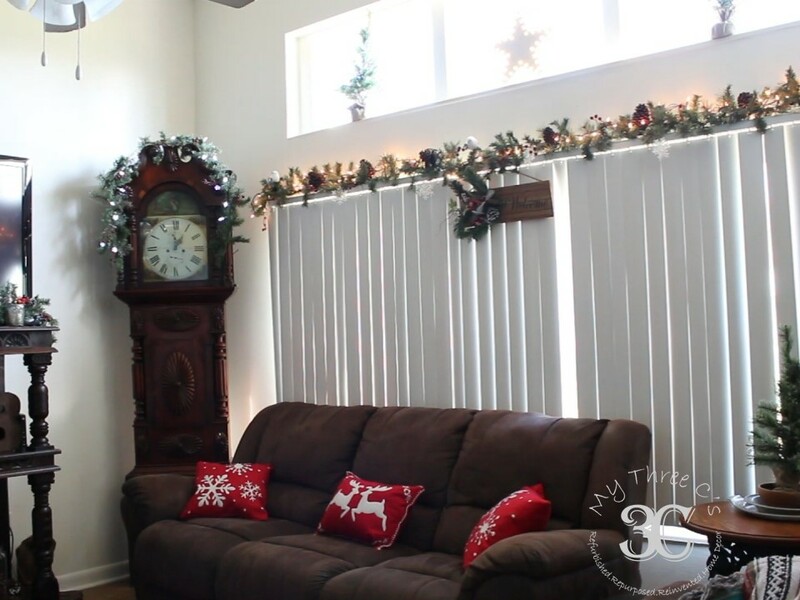 I hope you enjoyed my Christmas Living Room Tour and I hope that I gave some of you folks with small living spaces some inspiration to embrace your tiny dwellings and make a grand statement using items you already have and some thrifty finds. Merry Christmas to you and yours and I hope to see you all in the New Year! I would like to thank you for the efforts you have made in writing this knowledgeable article. Check out the best roller blinds to cover your window in reasonable amount.